Can Boko Haram be neutralized? Yes, target the group’s funding. Boko Haram (“Western education is forbidden”) is reeling under the pressure of Nigerian military operations, but its mobility and relatively low-cost operations in poorly governed territory will likely allow it to mount attacks despite dwindling resources. As Boko Haram is degraded militarily, it may squeeze locals more to provide for the day-to-day livelihood of its militants. 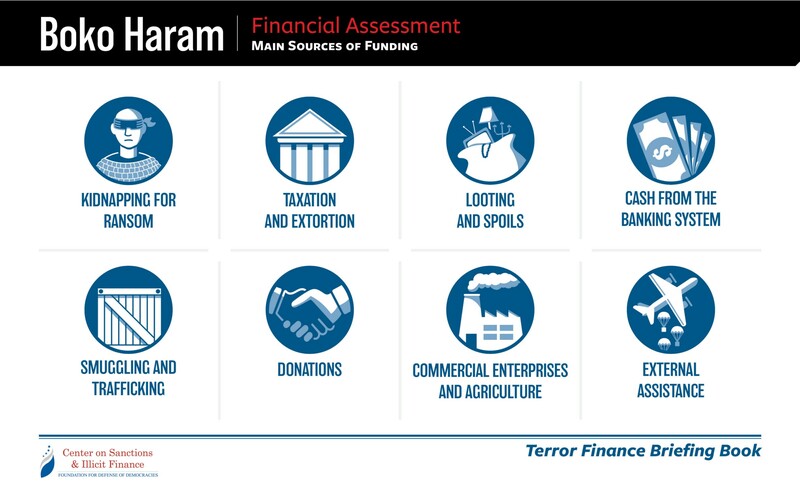 Operating mostly in remote areas where it exploits economically vulnerable populations, Boko Haram generated income streams of at least $10 million a year in 2014–15. However, its funding has likely since declined, and the group is now unable to pay all of its fighters’ salaries. The group’s funding is likely to withstand most restrictions on accessing the banking sector, as it uses the hawala system to move its wealth, some of which has come from supporters outside Nigeria. The group also uses criminal opportunism to raise funding locally, taking advantage of minimal state presence near the border. Originally dependent on bank robbery and smuggling, the group now relies more on kidnapping and extortion. Boko Haram uses quick-strike operations for its subsistence, ransacking villages and looting food and livestock. Boko Haram is a movement founded in northeastern Nigeria by Salafist preacher Mohammed Yusuf in 2002. The movement was initially nonviolent and focused on religious education, though it received seed funding from Osama bin Laden. In 2009, amidst rising sectarian tensions and heavy-handed treatment by the government, Yusuf’s followers clashed with Nigerian policemen, sparking widespread violence. Yusuf was later killed by police, prompting a reorganization under Abubakar Shekau, Yusuf’s deputy. Under Shekau, Boko Haram received training and support from al-Qaeda in the Islamic Maghreb (AQIM) and the Somalia-based al-Qaeda branch, al-Shabaab. This gave Boko Haram more operational complexity and notoriety as it focused more on suicide bombing and kidnapping for ransom. In early 2015, Boko Haram had freedom of movement across roughly 20 percent of Nigeria. A coordinated effort between Nigerian forces and African Union-backed troops from Niger, Benin, Chad, and Cameroon pushed it into the Sambisa Forest in northeastern Nigeria shortly after. In the midst of this offensive, Boko Haram pledged allegiance to the Islamic State (IS). The movement is now made up of two competing factions that disagree slightly on ideology and tactics: the Islamic State’s West Africa Province (ISWAP), headed by Abu-Musab al-Barnawi, the son of Mohammed Yusuf, and Jama’atu Ahl al-Sunnah lil-Dawa wal-Jihad (JAS), headed by Shekau. Both JAS and ISWAP are pledged to IS, but IS only recognizes ISWAP. JAS fighters tend to be locally oriented, often coming from gangs, while ISWAP has more AQIM-trained fighters and more connections to extremists outside Nigeria. The movement’s base is largely confined to the Sambisa Forest, but ongoing attacks from Boko Haram groups have created a humanitarian crisis in the region. The movement seeks to create a Salafist state. You can download and read the full assessment here. Find out more about the Foundation for Defense of Democracies at www.defenddemocracy.org, and follow us on Twitter, Facebook and LinkedIn. The Foundation for Defense of Democracies (FDD) is a non-partisan institution focusing on national security and foreign policy.